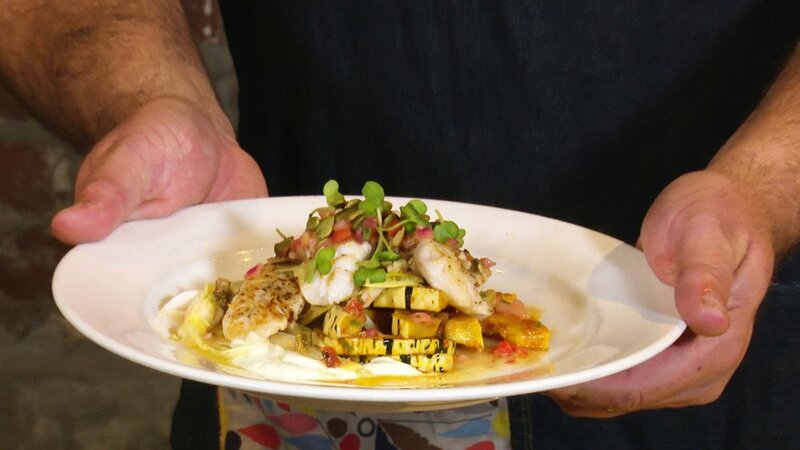 On this episode of On Foodable, we are featuring Chef John Sundstrom, owner of Lark Restaurant in Seattle, who will be working with wild Alaska pollock, provided by Trident Seafoods, to make a rustic Spanish-styled dish. This is the first episode out of our four-part series of chef demos that were filmed at our Foodable.io Seattle event, sponsored by the Alaska Seafood Marketing Institute. To begin preparing the sauce for the Spanish-styled stew, sauté diced onions in olive oil until light golden. Then, add the sliced garlic, and cook until softened. While that is cooking start simmering some fingerling potatoes until they are tender in another pot with salted water, crushed garlic, and a couple branches of thyme. To continue with the sauce, add some white wine to stop the cooking process. As the reduction settles down, add really ripe, rough-diced tomatoes to the saute pan, add kosher salt and pepper as it simmers. Don’t forget to season your wild Alaska pollock fillets with some salt and pepper before you add it to the sauce. You will simmer until cooked for about 5 to 7 minutes. Add a splash of more white wine and vegetable stock. Also, add some fresh thyme, a pinch of rosemary, and smoked paprika. Finally, remove from heat, then serve or cool. Smash potatoes (skins on) with a fork to crush open. Spoon braised pollock and sauce over the top. Sundstrom is the chef and owner of Lark Restaurant, which has been around for 15 years now. To replicate this delicious dish follow along by watching the episode above! After years of carrying an undesirable reputation, frozen food is making a comeback. The generation leading the trend is no other than Millennial. The same demographic that is renown to be the foodie generation, characterized to be particularly reluctant to sacrifice a food’s quality or nutritional value for, simply, convenience. That attitude still holds true and has not necessarily changed. What has changed is how these frozen foods are being produced. The positive shift towards frozen food is said to have happened for various reasons.